Shout Bands Stir Up Tubular Fervor In Charlotte In the Bible, Psalm 150 tells the faithful to praise the Lord with trumpet, harp, tambourine, stringed instrument and cymbal. In the United House of Prayer for All People, it's all about the trombones. No one knows exactly how trombones ended up in church, but it's an intensely vocal sound. 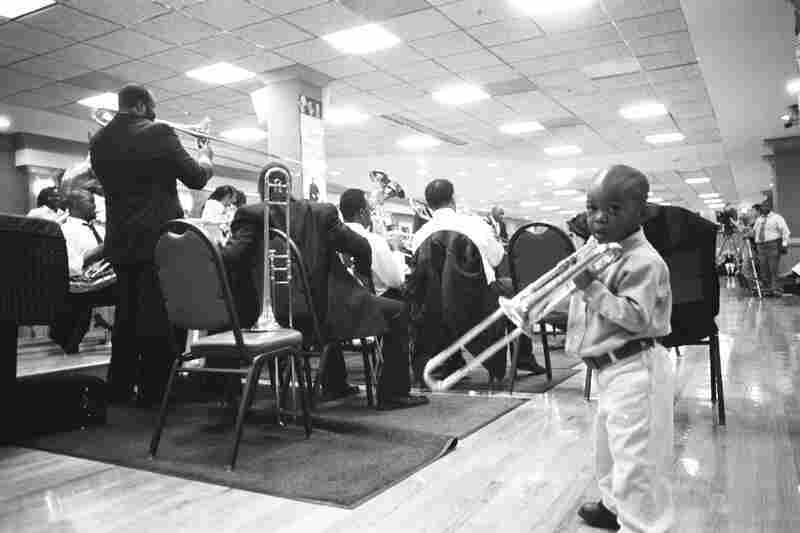 Cedric Mangum (left) leads a shout band as a junior member looks on. Members of one of the shout bands, Mighty Clouds of Heaven, stir up a tubular fervor. Cedric Mangum's wife leads the vocal choir. The United House of Prayer for All People is known for two unique traditions: mass baptisms by fire hose and exuberant brass bands. In addition to shout bands, the United House of Prayer for All People also has string bands. In the Bible, Psalm 150 tells the faithful to praise the Lord with trumpet, harp, tambourine, stringed instrument and cymbal. In the United House of Prayer for All People, it's all about the trombones. By midmorning, tithes have been taken and testimonials offered, and the members of Sounds of Zion are warming up for another three-hour service inside the formidable church on Statesville Avenue in Charlotte, N.C. Nineteen trombones, plus a sousaphone and percussionists, are seated between the congregation and the pulpit, which is shaped like Noah's Ark. The trombones collectively play a fearsome glissando, then a cymbal crashes and a man shrieks in uncontained spiritual excitement. These brass instruments are not a supplement to the service, like a typical church choir. Think of them as an accelerant, to both channel the musicians' expression of the Holy Spirit and to intensify the congregation's experience. The trombones keep it up for 5, 10, 15 minutes. The crescendo is almost unbearable. 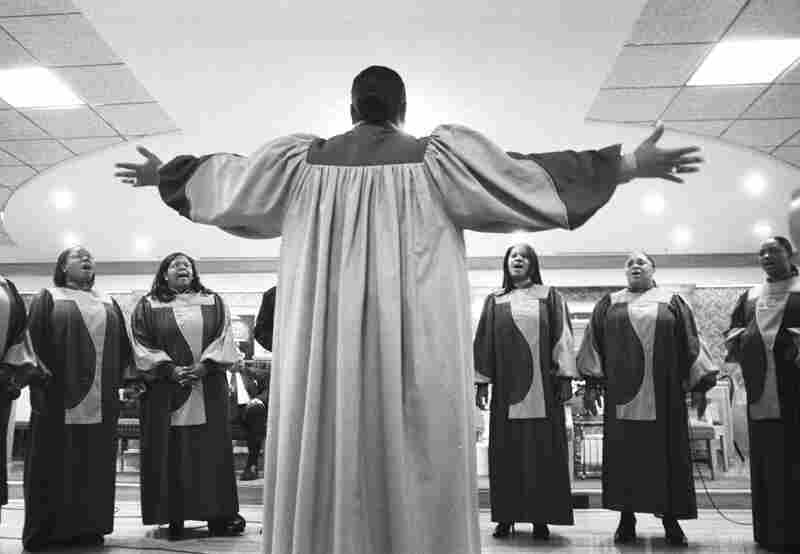 The "back men" are riffing furiously while the "run men" — the soloists in front — are bent at 45-degree angles flinging their slides with such force, it seems as though they'll sail across the Sunday hats of the women seated in the congregation. Now, everybody is on their feet, beating tambourines or dancing in place. A few people leave the pews and step out onto the wooden area in front of the pulpit they call "the threshing floor." A slim woman in a red dress and red pumps, whose daughter sits quietly in the pew, has been up dancing by herself in a sort of spiritual ecstasy. The music stops, but she doesn't. 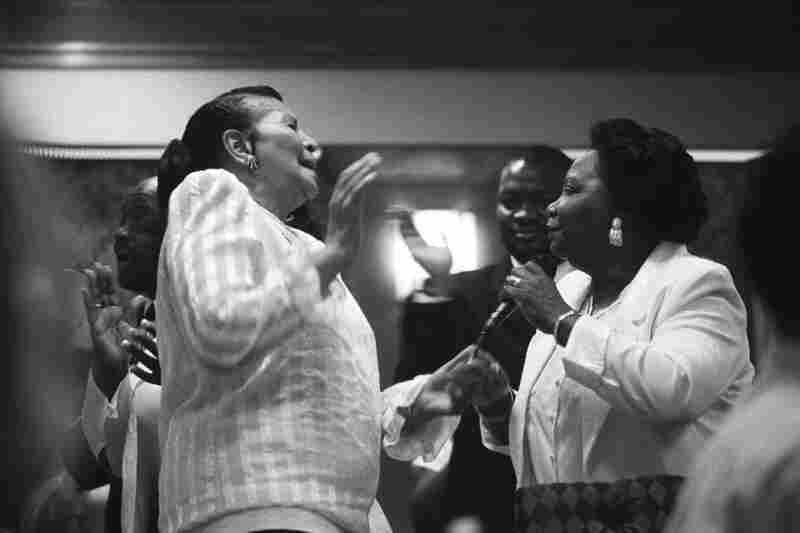 Her hands are up, her head is thrown back, and she is speaking in tongues in the tradition of the Pentecostal Church. She is Gloria Hicks-Pauling. After the service, she says she's been a lifelong member of this church, but that the services are especially meaningful now that she and her husband have lost their jobs and their house. "The music really helps," Hicks-Pauling says. "It kinda softens the heart. Kinda makes you happy, makes you cry, but you're not crying because you're sad. Right now, I'm going through a terrible time, but looking at me, you wouldn't know it." No one knows exactly how trombones ended up in church. These groups are called shout bands. You can hear how the instruments shout back and forth, like a call and response or a gospel quartet. It's an intensely vocal sound. The United House of Prayer came into being sometime after the summer of 1926. That was the year its founder, a charismatic evangelist named Charles Manuel "Sweet Daddy" Grace preached a tent revival here in Charlotte's Second Ward neighborhood. Thousands attended. It became a phenomenon, then a church. Sometime in the 1940s, trombone choirs became a signature of the United House of Prayer. The United House of Prayer for All People is known for two unique traditions: mass baptisms by fire hose and exuberant brass bands. The mother church is in Washington, D.C., in an imposing gold-domed structure the church calls God's White House. The denomination has some 140 churches across the country with a million and a half members. Charlotte, its birthplace, has 17 congregations — more than any other city. "You know when you're playing the horn, it's a revelation that you get from God, like we say, to touch the people; to touch their hearts and their minds. And you get something out of it for yourself," sousaphonist Andre Guy says. Sounds of Zion leader Trey Epps adds, "The shout is pretty much like how we give praise — how we give God thanks for everything he's done for us." Shout bands are an exceptional tradition in the great sweep of American sacred music. They're similar to but distinct from the second-line bands in New Orleans. And shout bands are not particularly well-known, even though they play occasional festivals and have performed at the Kennedy Center and Carnegie Hall. "Our music is not designed for the dollar," says Cedric Mangum, a famed Charlotte shout trombonist. "We're not trying to make a living with this music. It belongs to God." 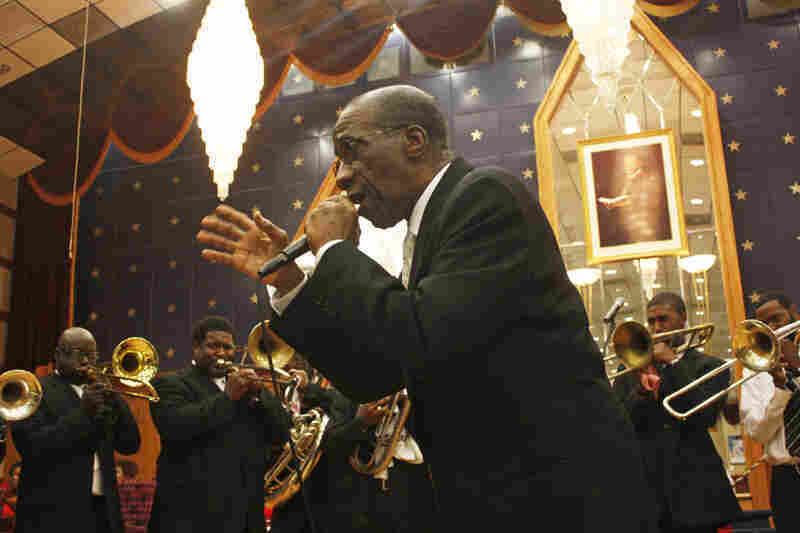 Mangum, who's a barber when he's not blowing his trombone, estimates that there are 50 to 75 shout bands across the country. "If I'm sick while I'm playing, I ask God to heal me," Mangum says. "If I'm burdened down, I ask him to lift me up. That's what happens when I play." 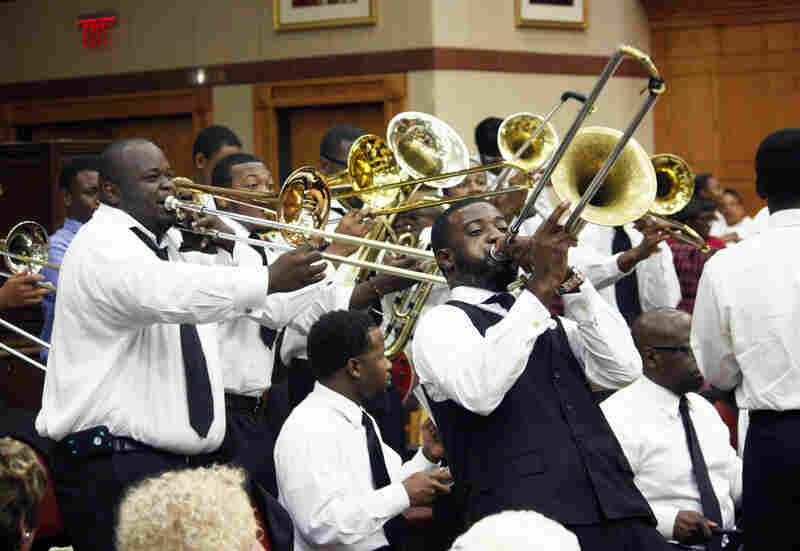 Joining a shout band is a commitment — in addition to Sunday morning, this church holds musical services six nights a week — yet the holy trombones of the United House of Prayer for All People seem to be doing just fine. Youngsters are backfilling the bands, keeping the continuity going. They don't learn from recordings or sheet music; instead, they learn shouts person-to-person from elders like Mangum. "When we're dead and gone," Mangum says, smiling, "this music is gonna continue on. Continue on." We'd like to hear from you for potential future stories. Tell us about sacred music in your community in the comment section.